Our Bendix/King KT 73 Data Link Transponder with Traffic Information Service (TIS) functionality delivers enhanced safety, operating efficiency and information-exchange capacitiy for your aircraft. 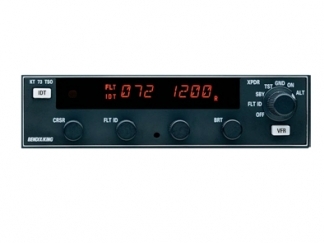 The highly reliable and compact Bendix/King KT 73 Data Link Transponder is an affordable, solid-state General Aviation transponder with Mode S capability. As a panel-mounted unit, the KT 73 is designed for new or retrofit installations, as it fits the same mounting rack as our KT 76A/C and KT 70/71 transponders. Rotary knobs allow for easy squawk code entry or changes to your aircrafts flight identification code. The KT 73 meets TSO-C112 for Class 2A ATCRBS Mode A/C and Mode S Airborne Transponder Systems, while also meeting European non-diversity elementary surveillance mandate requirements, including surveillance identifier codes and Flight ID, and is certified to JTSO-2C112a. Additionally, the KT 73 is fully field up grade able (software only) to include air-to-ground Automatic Dependent Surveillance Broadcast (ADS-B) operation. This transponder function enables aircraft to transmit position, altitude and vector information derived from the on-board GPS system for use by ATC facilities.